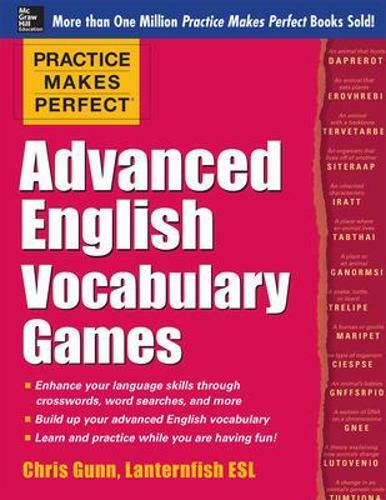 Take your English vocabulary to an advanced level with games, games, games! Beat the boredom of language drills and rev up your English language learning with Practice Makes Perfect: Advanced English Vocabulary Games! Inside you will find word searches, crosswords, "word paths," word scrambles, proverb puzzles, and more. All will help you master 800 advanced-level English words and phrases. These engaging games will build your English skills and boost your ability to recognize collocations, figures of speech, idioms and proverbs, word play (alliteration and rhyme),and phrasal verbs. This advanced-level workbook is a perfect complement to your ESL class, or it can be used as part of your self-guided learning. So put on that puzzle-solving hat -- Practice Makes Perfect: Advanced English Vocabulary Games is the fun way to increase your knowledge of English words and communicate more confidently.